Despite my best efforts, I awoke yesterday with a fairly massive hangover. Perhaps my 2AM shot of Polish vodka at the trendy Olsen wasn’t the wisest of choices. So much for trying to keep up with the locals. Fortunately, the weather gods decided to give me a break by sending a fairly large rainstorm my way. The storm was a bigger plus in that it cooler down temperatures considerably. Given the new school feast I had at iLatina, I thought it would fun to try another parilla and go old school. 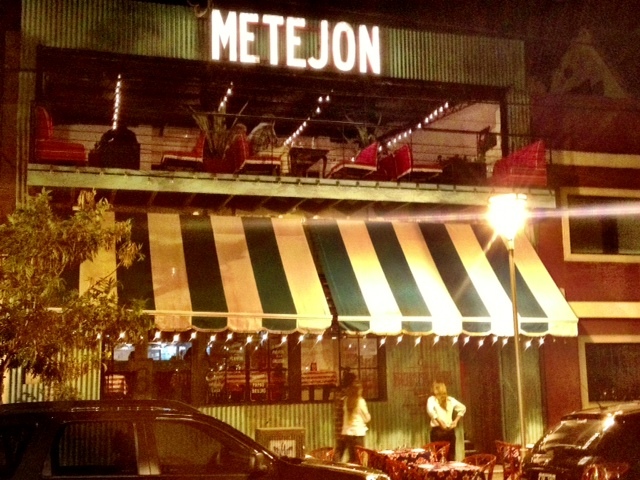 I had asked the owner of iLatina some of his favorite parillas and he suggested going to one near Las Canitas. I had wanted to check out the nightlife there so that seemed to be a good fit. He said the name of it seems to change frequently so he just gave me the address. Since this was apparently a very popular spot, I headed out a bit before 9 to trek up there. Las Canitas is very close to where I’m staying but the catch is that there’s this large train/subway that divides the two barrios so it takes longer than it looks. Still, the weather was just about perfect – high 60s with a nice breeze – so the walk was welcomed. 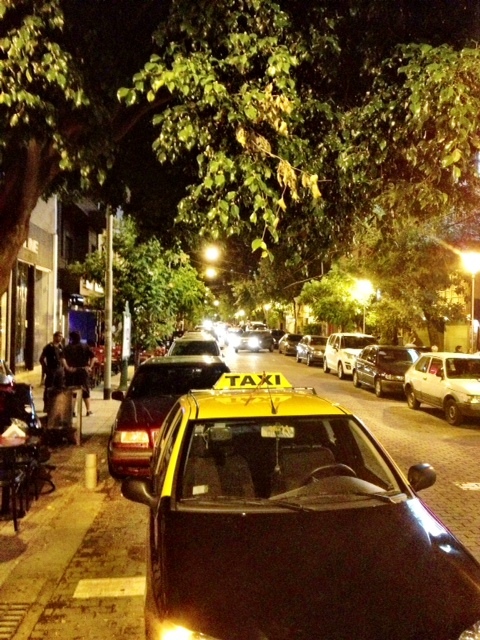 I zigzagged my way up some side streets and soon got Dorrego, where the parilla was located. He had warned me that there’s no sign so it was easy to miss – which is exactly what I did the first the passing it. There was a small glass door but it was tinted so I couldn’t really see inside. However, the door opened soon after and it looked to be the place. I soon realized this was it when I saw the following when turning to the right. 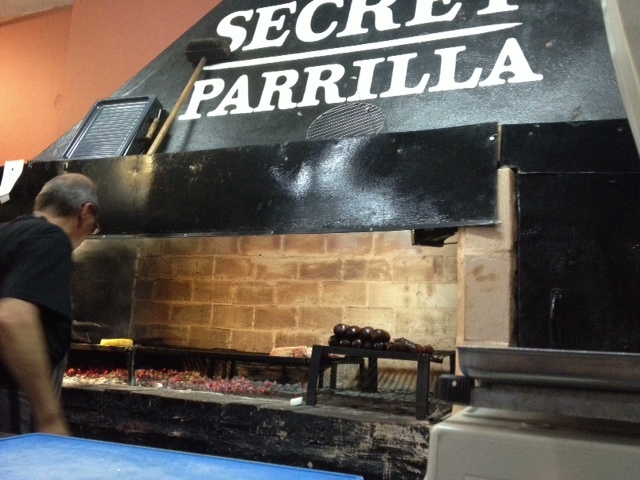 Yes, this was the Secret Parilla. It was packed but there was a small table right next to the parilla so they gave me that one. At first blush, it looked like a lot of the parillas I’ve seen here. 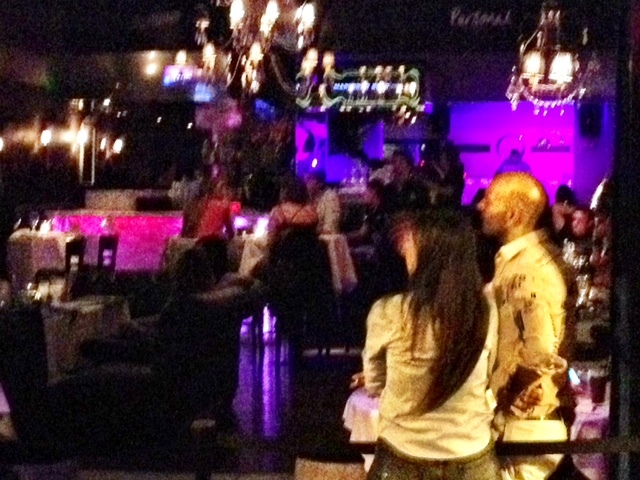 The room was filled with locals, mostly couples out on what must be date night for them. The owner was a fairly gruff looking chap and his son was the only other waiter. The man running the parilla was very cool though and I loved watching him work. Unfortunately, that would be the last photo I could snap as the owner approached me and made it clear he didn’t want to taking any more pictures. He bemoaned the fact that some websites had exposed his precious parilla and I think he just didn’t want his locals to be shut out of eating there. However, this night I was the only interloper. There were two interesting things about this parilla. One was the fact that if patrons ordered a bottle of Norton wine (a mid-level Argentine wine) they would get a free bottle of champagne with it. 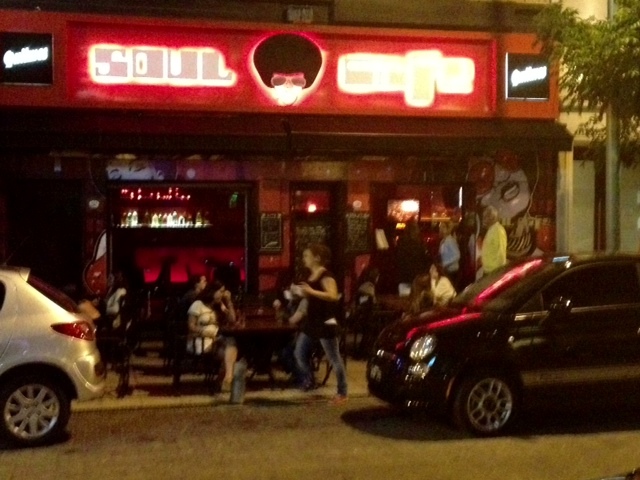 Given I was flying solo, I opted for the glass of red, which was only $10 pesos (water was $15 pesos.) The second thing was that the parilla guy would go over to a scale that was next to me to weight the various meats. This was because your order was either a portion or a half portion. A portion was a kilo and there was an option to get half of that. I opted for the half portion of the chorizo – which in Argentine steak land is a sirloin. The chorizo came on its own large metal platter and was a truly impressive cut of meat. It was perfectly cooked and for once, thankfully seasoned correctly. Not bad for $60 pesos. Now I knew why this place was both so popular and “secret.” I love old school places like this and will honor the tradition by not saying where exactly it is. Sorry amigos. With a belly full of meat and wine, I was getting a bit sleepy but still wanted to see Las Canitas so I sallied forth. Having been there before, I could tell that the main action was on a street called Baez so I headed there first. A short while later I approached Baez and the street was teeming with activity. 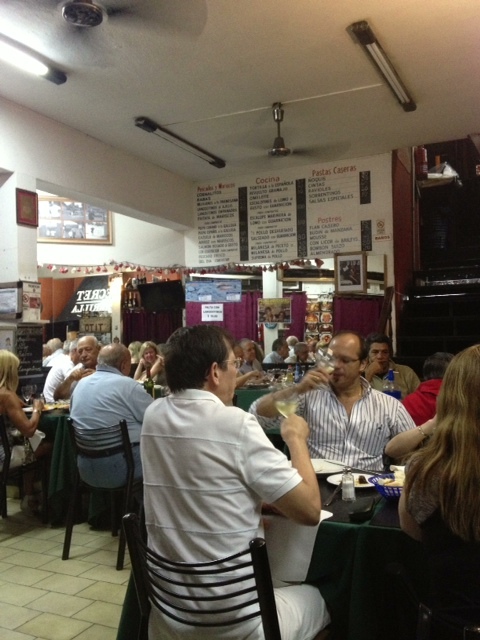 By Buenos Aires standards, it was still very early (11PM) so most people were at the various restaurants having dinner. Since it was so nice outside, most were sitting outside and the whole street was filled with the sounds of people talking. I walked down the street to a cool looking open bar that was one of the only ones to have people actually drinking versus just eating. Called Lupica, it was a Mexican themed bar, complete with luchador masks, Dia del Muerte art and other Mexicana staples. The DJ was playing some great house music so I sat down at the bar and ordered a (now much maligned) green apple margarita. As I stated on Facebook, it was delicious and yes, slightly girly. The crowd was fairly young but friendly, and I enjoyed watching the action unfold as I sipped my massive drink. It was now midnight so I decided to continue cruising around. Unfortunately, my back-to-back-to-back late nights started to take a toll on me and I knew it wouldn’t be 4 nights in a row. So yes, dear readers, no crazy stories to share alas. Instead, I just walked around and took some pictures of the various bars and vowed to return next week when I had more energy. 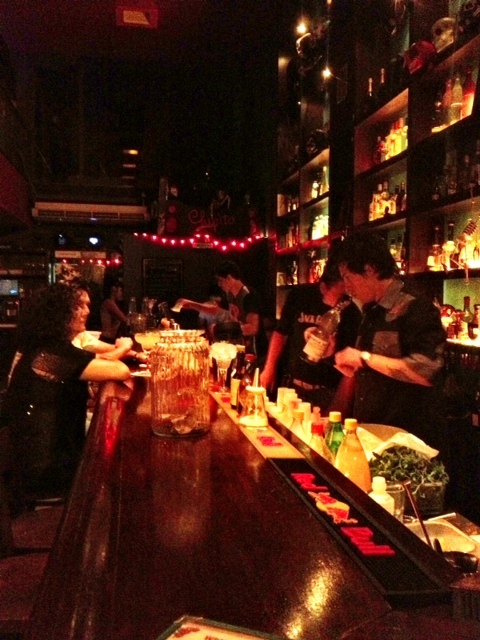 Mute Bar – definitely will check this out again. 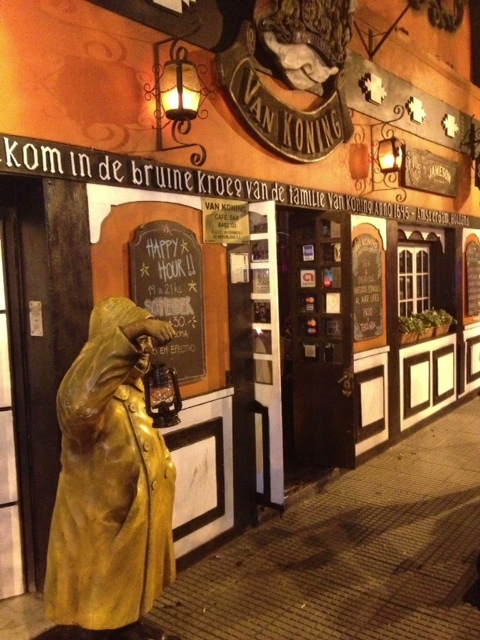 A Dutch owned bar that unfortunately was dead when I was there. Posted on January 20, 2013 by reyalto. Bookmark the permalink.